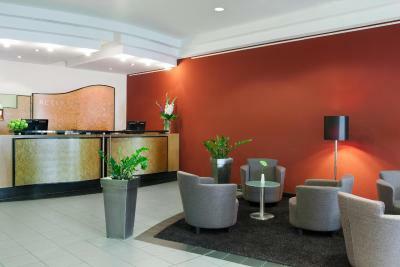 Lock in a great price for IntercityHotel Augsburg – rated 8.1 by recent guests! They gave us a day ticket for transportation (can use all buses and trams during my stay for free). Although you can buy the ticket from vending machines in all stations for 8.4 Euros for 2 people, but still, was a really nice gesture. Location is GREAT if you are coming/going by train, it is right at the door of the main train station. I’m allergic to feathers so the pillows had to be replaced. The bed was pretty hard but not anymore than most hotels in Europe. Great practical location and lovely staff. 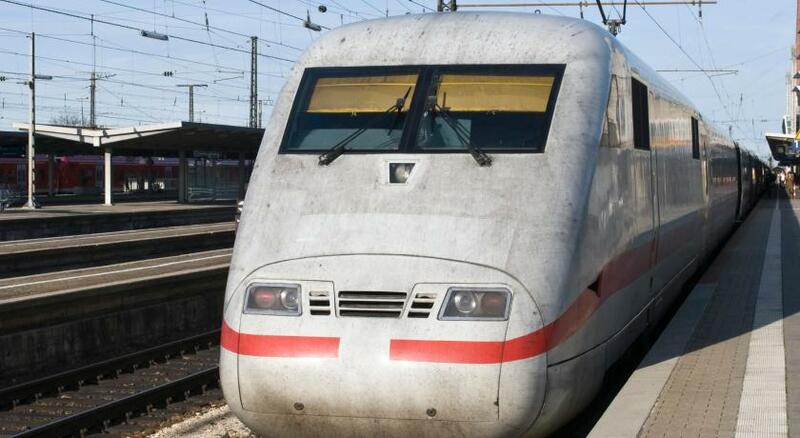 Besides, there is a free ticket for the Public Transport Augsburg inclusive. Room is small but comfortable and clean. 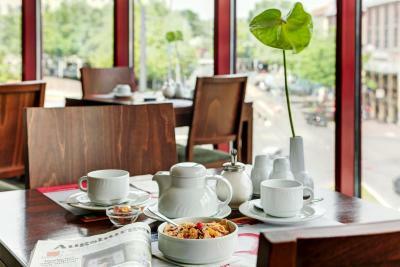 Location is excellent which is right next to Augsburg main station. The hotel is next to the trainstation but you don't hear the trains. 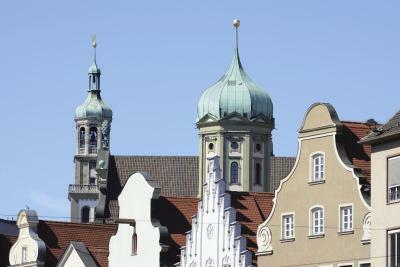 At arrival you receive a free pass for public transport in Augsburg. 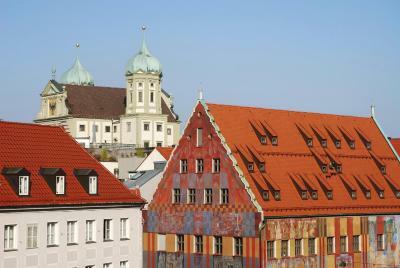 The hotel in a short walking distance of the centre of Augsburg (less than 10 minutes walking). The rooms are clean. Extremely friendly staff, very clean, excellent value for money. 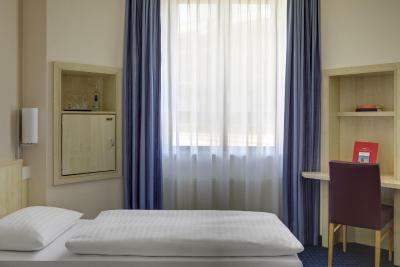 Quiet and extremely clean hotel close to the Bahnhof. Young personnel with right attitude, willingness to serve was obvious. Breakfast was really, really good and the service fast ; again young people enjoying their work. 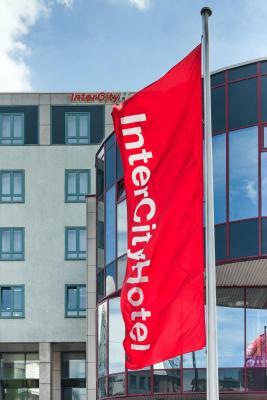 IntercityHotel Augsburg This rating is a reflection of how the property compares to the industry standard when it comes to price, facilities and services available. It's based on a self-evaluation by the property. Use this rating to help choose your stay! 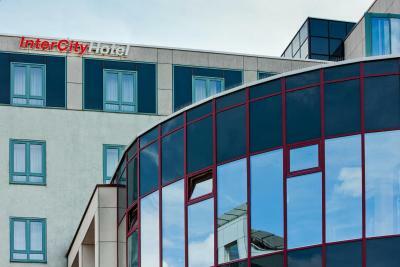 This InterCityHotel hotel is directly next to the Augsburg train station. 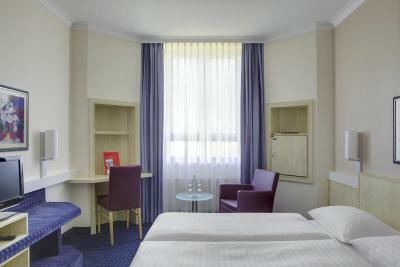 It offers soundproofed rooms and free access to public transport. 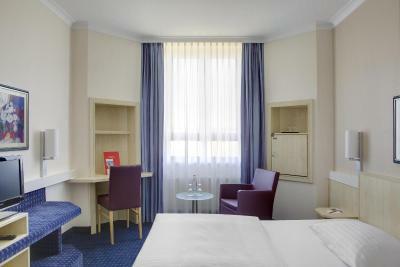 The InterCityHotel Augsburg has bright, modern rooms with desks and Wi-Fi. 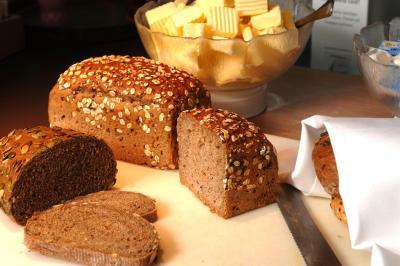 A varied breakfast buffet is prepared at the InterCityHotel Augsburg each morning. A FreeCityTicket is available to all guests at no extra cost and is valid on all local public transport. 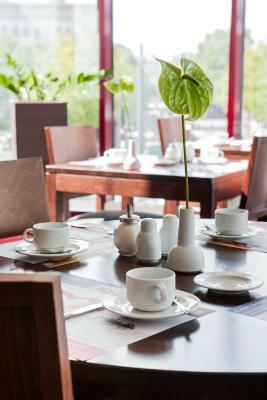 When would you like to stay at IntercityHotel Augsburg? 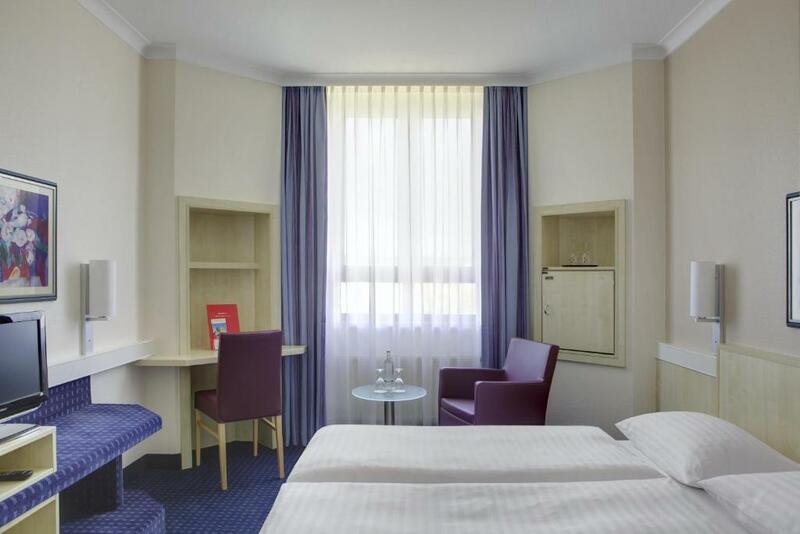 This tastefully double room is facing the street and features free WiFi access, free city public transport ticket, a TV with free sky sports channel and a private bathroom. 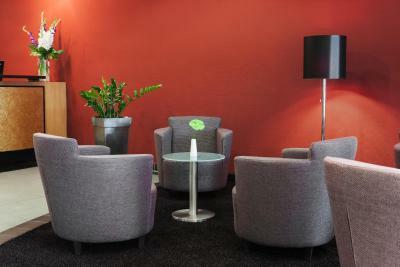 These nonsmoking rooms are located in a quiet part of the building. Included is a ticket offering free public transport. 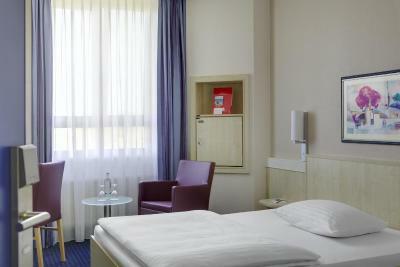 The rooms are are equipped with either one large bed or two separate beds as subject to availability. This room is facing the street and features a TV, a mini-bar and a bathroom with hairdryer. Guests can enjoy the free sky sport channels in the room. Included is a ticket offering free public transport. 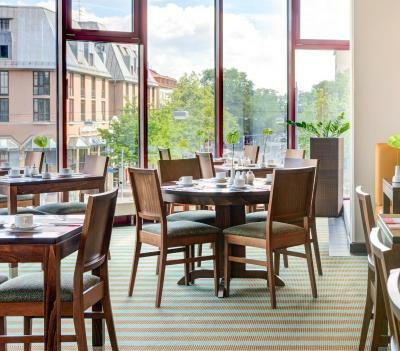 Mobile at any time - with the FreeCityTicket included in your room rate you can use local public transport free of charge during your stay at the InterCityHotel Augsburg. 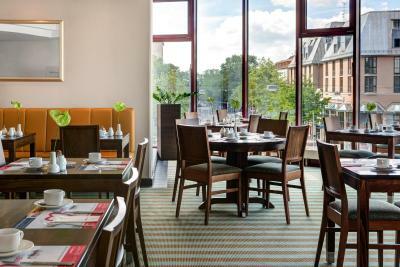 House Rules IntercityHotel Augsburg takes special requests – add in the next step! 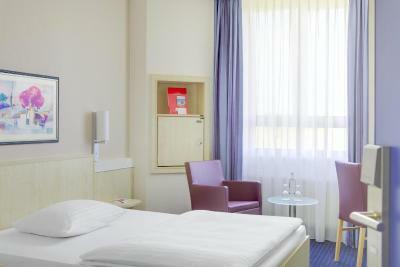 IntercityHotel Augsburg accepts these cards and reserves the right to temporarily hold an amount prior to arrival. 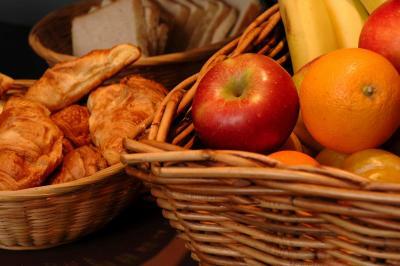 The hotel provides free-of-charge Wi-Fi use, subject to conditions of bandwidth usage and access. Further details are available from the hotel upon request. Please note that this hotel is strictly non-smoking. If you want to drive into central Augsburg, you must buy an Umweltplakette (fuel emission sticker). Horrible. 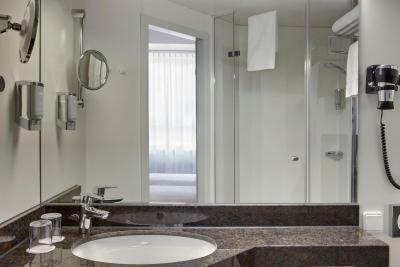 Tiny room and an even tinier bathroom. The TV is sized accordingly, about the size of a tablet. Extremely expensive at 180€ excluding the parking fee, I had to book this hotel as a last minute emergency as it was the only one with availability. No wonder why. Only come here if you have no other choice. Or sleep in the car if you have one, at least you'll have some space ! The Italian Café next door is good! great place, i will back again! Breakfast was good. Breakfast room good. It would be better if the hotel offers more English and Arabic TV channels for non German speaking guests. The hotel is clean and very near to everything. The best is the city transport tickets for the whole stay. Staff were friendly and did their best to help whenever we needed something. Highly recommend to others to try this hotel for their next stay. It was sometime a little noisy because of the proximity to the main station. The door card. Need to swipe like 30 to 50 times to unlock the door. Changed the card and still not working. Pillow a little too soft. Location next to the Augsburg train station. Helpful front desk staffs. They don't have water boiler so for people who get used to drink warm water is not convenient. The pallow is too soft, it becomes totally flat when lying on it in few minutes. Wifi needs to log-in everytime, a little bit bothering.